LuxePineapple recently had an incredible "Build Your Own" Box of Joy event! This much anticipated beauty extravaganza featured amazing brands to choose from. A special discount code was even sent to Pineapple Lovelies to apply to orders of $25 or more to get 40% off! If you are unfamiliar with the concept behind LuxePineapple, see my original post here! This event built up so much excitement in the beauty community that LuxePineapple's website saw record breaking traffic. I had to act so fast putting in my order I felt like I was in a race! The moment my order went through and I returned to the Pineapple Shop, this Cargo palette was sold out! 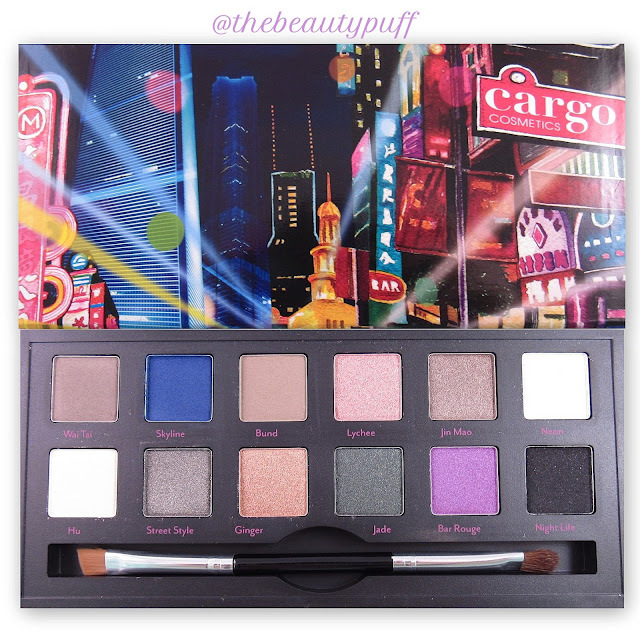 The two items I chose were the Cargo Shanghai Nights palette and the Maybelline Color Whisper in One Size Fits Pearl. I love versatile, natural lip shades that can go with any look so that was why I chose the Color Whisper. It's a really pretty sheer pink with a slight sheen that's right up my alley! Best of all, I can throw it in my purse and not worry about having a mirror with me for application. It is versatile enough to coordinate with any look and provides shine without being sticky or goopy (technical term!). The Cargo palette was the first thing that caught my eye in the Pineapple Shop. There was another palette with mostly neutral shades, but I really wanted the pops of color in this palette! The shade selection is really nice in this palette. There is a mix of finishes and a good combination of neutrals and pops of color. The brush is actually a lot nicer than I expected too. I normally do not use brushes that come with palettes but this one is particularly soft. One side is a flat shader and the other is an angled liner brush. The palette also features a mirror which is perfect for travel. Wai Tai & Bund are fabulous neutrals with a slight sheen. They are my go-to colors for my crease in this palette. Skyline is the only color I found that does not come off as pigmented as it appears in the palette. That's actually fine with me because this shade would most likely serve as a pop of color for my lower lash line. Using a stiff liner brush seems to do the trick! Lychee, Jin Mao and Ginger are my favorites for all over lid colors. They are incredibly shimmery with high pigmentation that lasts all day. They really make your eyes pop! Neon is a frosty pale yellow and is a perfect inner corner highlight. It is almost iridescent so I love this on top of some of the darker shades in the center of the lid for added dimension. Hu is a pale ivory tone with a satin finish. This shade works well as a brow bone or inner corner highlight. Street Style and Jade are stunning deeper tones that I have tried all over the lid and as liners. You can't go wrong either way with these shades. Street Style topped with Neon is particularly stunning! Bar Rouge is a beautiful iridescent purple that can be layered for intensity. It looks gorgeous blended in the crease combined with a Lychee in particular. Night Life is an intense black with silver flecks. This makes a really pretty liner. I have used it with an EcoTools angled liner brush and had no fallout with this method. Overall, I am ecstatic that I was able to get these items! I could not believe how quickly things sold out even within the first half hour. If you want to be the first to know about new releases, discounts and events at LuxePineapple, be sure to sign up for their emails! Keep an eye out, because the LuxePineapple line of cosmetics has some great things planned for this summer!! What did you get in your Box of Joy? *Disclaimer - These items were sent to The Beauty Puff for review.